Reviews | Regal Caribbean Sunrise Jerk Seasoning - 10 oz. Add a bright burst of Caribbean flavor to your hearty meats with Regal Caribbean sunrise jerk seasoning! Featuring the zesty flavors of Caribbean spices, this jerk seasoning is primarily used in the preparation of grilled meat. Jerk seasoning can be either rubbed directly onto meat or blended with a liquid to create a marinade. Whether you use it for sauces, meat rubs or more, this pre-mixed blend is a quick way to enhance any recipe with robust flavor! After visiting Jamaica for my 20th wedding anniversary 5 years ago I fell in love with the islands signature dish Jerk chicken. I have not been able to duplicate it successfully with my own store bought seasonings then I found the Regal Caribbean Sunrise Jerk seating in the 10oz container. Finally my Jerk chicken takes me back to the islands. Rub your chicken with a little olive oil and massage the Jerk seasoning all over the chicken as baby or light as your pallet can handle. It is best covered with plastic and marinated overnight. Toss it on the grill and put on some reggae music and you will feel like you are on vacation. Great product, flavor and level of heat. Brings me back to the islands with this. Hints of sweetness with just the right amount of spice. I really liked the results with this. A great jerk seasoning for making jerk wings! This is a fun unique blend that is worth giving a try, lots of flavor and aroma as expected with jerk. I use this on all my chicken and pork that we prepare. I have started using it on my white that I prepare and wow what a flavor it adds. This Regal blend is sweet, tangy, and spicy all in one. It does compliment many dishes. I go find it especially good on grilled vegetables. I don't get to use this often enough! It has the heat that you'd expect from Jerk seasoning which means it isn't overwhelming and it allows the complexity of the other herbs and spices to come through. Has a nice smoky under-flavor to it; pairs great with citrus salsas! We have been using jerk for wings for years, but when we got this we figured we should expand on that. works great on the flat top with chicken or beef sandwich slices to give them a different flavor. top it with some flame grilled pineapple and you really have an awesome sandwich on your hands as the sweetness of the fruit really sets off the jerk seasoning. This is a very tasty blend. However, if someone asked me to try it without telling me it was jerk seasoning, it's unlikely I could identify it as such. Its spice is a black pepper heat, rather than a hot pepper heat. The traditional allspice, cinnamon, etc flavors are very subtle - you really need to be looking for them. That said, this is a great base for chicken or pork, and would be good on fish as well. For "jerk" flavor, be prepared to add to this blend. Love this jerk seasoning because its actual spices, not salt and fillers. Great, authentic flavor, easy pour, doesnt clump too! I'll absolutely buy this again. I primarily use this in my marinades. And I love it. It gives the meat a wonderful flavor. I Wil definitely order more when I need it. We love this seasoning. We use it on all different kinds of fish. It enhances the fish without overpowering. Paired perfectly with a pineapple salsa. A great rub to have around when grilling during the summer season. Taste great on chicken and fish, add an orange glaze and some fresh vegetables and you'll have a dish to remember. I usually make my own rub for jerk, but this one comes in handy when I am in a rush, and some people have not noticed the change when I use it. I like this very much. We are happy with our purchase of this caribbean sunrise jerk rub. The quality is excellent. The taste is delicious. We would recommend it to anyone. Great flavor! 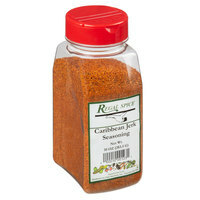 We use the Caribbean Sunrise jerk on chicken, pork, beef and wild game. We grill with it, broil with it, bake with it and fry with it. Great for all around use. This is hands down the best caribbean jerk spice i have ever used. It has intense flavor and adds a lot of pizzaz to your chicken wings, and chicken based pastas. I love it. Fantastic inexpensive spice that is a great addition to any kitchen! Great for making Caribbean Jerk Chicken Wings! Add some honey and this spicy mix will be sure to please any wing lover! Great price!